Have you ever wondered what it would sound like if a bunch of Pennsylvanian backwoodsmen stumbled across an abandoned truck in the woods full of modern musical equipment plus several months’ supply of mescaline and proceeded to get their freak on? We doubt if you have ever really pondered this, but we reckon that it would sound something like Where I’ve Been Is Places And What I’ve Seen Is Things the new release on Sunrise Ocean Bender Records from Evening Fires. From their secret den in a northern Appalachian forest, Evening Fires brew up a rich blend of wide-spectrum psychedelia, with ingredients ranging from earthy folk sounds to cosmic drones and to full-on rock freakouts. 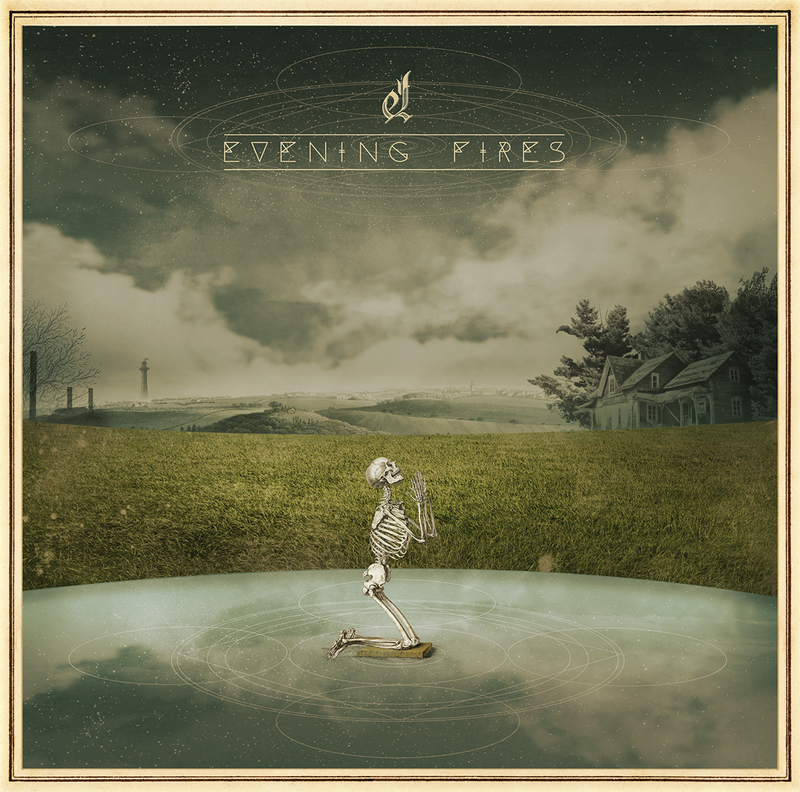 Evening Fires folksy, rural psychedelia comes from deep in the dark woods revealing the true spirit of “the psychedelic”, absorbing vibrations from nature and the stars. Where I’ve Been Is Places And What I’ve Seen Is Things is an album of freeform twisting instrumentals informed by a mix of the traditional roots music from the region where they live, Acid Rock and the Kosmische sounds of bands like Guru Guru, Bröselmaschine and Amon Düül. Slow burning lysergic jams gently ebb and flow drawing you deeper into their eerie soundscapes, ‘We Cast Our Lots With The Waves’ is like a Kosmische Folk reimagining of Terry Riley while weird little bits of violin drone emerge out of the guitar noise of ‘Too Many Ravens, Not Enough Corpses’ pulling you further in. The two parts of ‘Staring Down The Gullet Of The Great Beyond’ and ‘Space Mountain’ are what can only best be described as “Appalachian Space Rock”…..these tracks are full on Acid Rock improvised/experimental freakouts which bring to mind 60s sonic adventurers The Red Crayola that with judicious editing have been cut down to around the 5 minute mark. Although Where I’ve Been Is Places And What I’ve Seen Is Things is not the most easily accessible album ever (it takes a few listens) but given time it becomes a beautifully absorbing record and is well worth checking out. Released in tandem with Where I’ve Been Is Places And What I’ve Seen Is Things is Incredible Adventures on Evening Fires own Deep Water Acres imprint, featuring longer tracks from the same sessions that didn’t quite fit on the album, this excellent EP can be considered as a companion piece to the album but is strong enough to work as a standalone 4 track EP on its own merits. It’s another plunge into the great beyond as begun on Where I’ve Been Is Places And What I’ve Seen Is Things and needs a few listens to tune into Evening Fires strange frequency however this is possibly a little more accessible, with a folksy strum-along (‘Big Farmer, Big Jesus’), ambient soundscaping (‘There Is No Going Without Returning’) and a couple of great Kosmische/Acid Rock epics … ‘Unaussprechlichen Kulten’ (a fictional work of arcane literature that first appeared in Robert E. Howard’s short stories and later mentioned in several stories by H. P. Lovecraft trivia fans) is a dark, brooding track falling somewhere between Popol Vue and Sunn O))) while ‘Staring Down The Gullet Of The Great Beyond Part Three’ is more mind expanding “Appalachian Space Rock” but this time given more time to stretch out and explore.